The first Sunseeker 95 Yacht, Miss Ellie arrived in the US a few months ago and the Poole-based builder was happy to show it off for the first time to an American audience in June. However, it sold several of the 95 Yachts in the US already, based on the design revealed in 2015. What accounts for that early success is that the 95 Yacht checks off quite a few must haves for yacht owners. Relatively compact and hence easier to dock, it has luxurious spaces, a large superyacht sundeck and a great range of cruising speeds. Capable of long distance cruising, it can also take a quick dash to escape a storm, for instance. There is no escaping the storm on the day Sunseeker took Miss Ellie out for a spin, though. It’s a typical Florida summer day with tropical rain and wind gusts raising a bit more than the regular wake on Biscayne Bay, a perfect day then to try this Sunseeker yacht out. This yacht went to a repeat client who uses his boats primarily on the East Coast of the United States and the Bahamas. 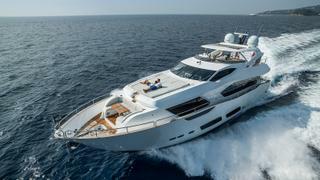 He bought it as designed and made no changes to the Sunseeker’s layout but the yacht features several upgrades from the standard equipment package. Yachtbuilders of late have gone back to the drawing board to increase volume on yachts 30 metres or less, to carve out more space for guests and crew. 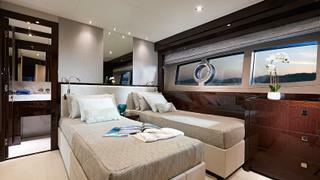 The Sunseeker 95 Yacht does just that, adding a one-of-a-kind three-level master cabin to the mix. 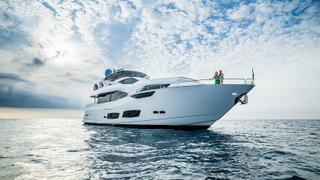 It’s a jaw-dropping feature, especially considering the yacht’s length. 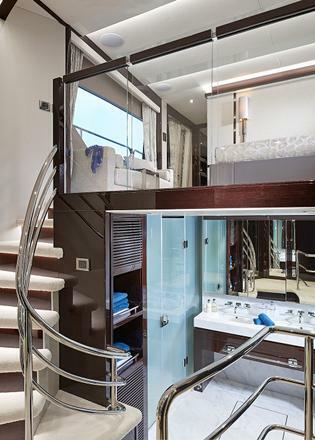 On the main deck level is the generously sized bedroom with large windows on both sides; half way to the lower deck are large closets concealed behind mirrored doors around a landing — a great dressing area — and further down is a bathroom finished with honeycomb marble, the go-to solution for luxurious looks without too much added weight. 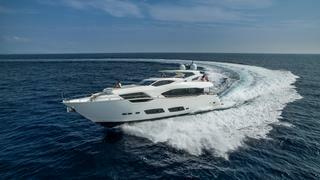 The 95 Yacht is an evolution of the 28 metre, explains Sean Robertson, Sunseeker’s sales director: “The whole idea with it was to take a very successful platform that we know performs very well, a pair of 12V MTUs, fully stabilised with the Trac system that gives underway and at-anchor stabilisation and twin generators. The trick to achieve this was to modify the deep-V hull, keeping the fine entry but tapering the angle aft to increase the lift and enhance efficiency at lower speed. Another goal for the hull modification, Robertson says, was to account for the larger fuel tank and support the added weight of a large superyacht tender. But never mind all of that, the star of the new design is a main deck fully dedicated to the pleasures of the owner, with a nice saloon/dining combination, a compact but professionally equipped galley with its own entrance and the spectacular master cabin up front. Sunseeker is more than willing to work with a client’s chosen designer but also offers a number of pre-designed schemes including wood veneer, stones and fabric selection. That’s the case with Miss Ellie, which features American walnut as the primary wood and a pleasant décor with furniture designed and built in house at Sunseeker’s shipyard. 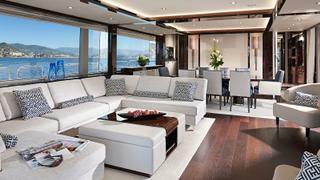 The master cabin enjoys especially good views. Sunseeker judiciously cut the tall bulwarks at the cabin’s level, replacing it with clear glazed inserts, so water views are ubiquitous from the bed. On the lower deck, Miss Ellie has four cabins, one of two currently available options — the other a three-cabin layout on lower deck. For added flexibility the two beds in one of the cabins can be made as one. 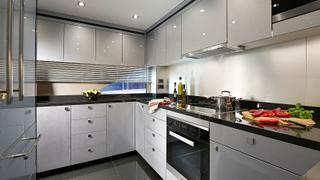 The large glazed surfaces seen on the outside allow plenty of light inside the cabins. 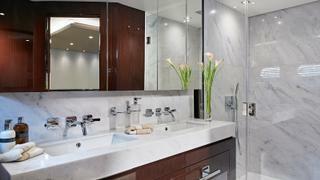 All have their own en suite, so the layout works very well for charter as well. 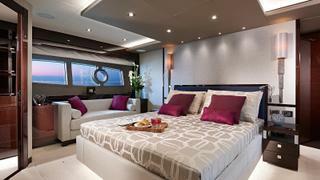 Crew quarters, for four, are situated aft on the lower deck, configured on this hull as two cabins with two bunk beds. One go-to solution for boatbuilders to carve out more interior space is to use a raised pilothouse design and that’s the case here. 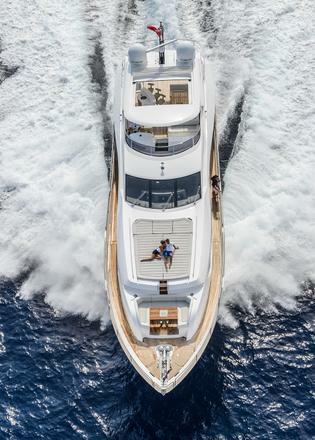 Although the large sundeck, covered with a large hardtop in carbon fibre, is where everyone first assembles as Miss Ellie heads out of the Epic Marina in downtown Miami, the comfortable superyacht wheelhouse quickly proves one of the best places to be to run the boat on a stormy day. 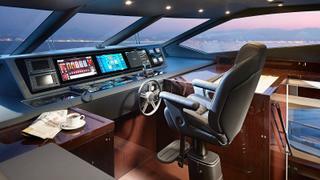 It’s cosy and aglow with the displays of its triple Simrad screens (Furuno or Raymarine are also an option). The screens deliver navigation and monitoring essentials, while two smaller screens display the boat’s two MTU 12V 2000 M96Ls’ performance and fuel burn. An optional joystick is available for increased manoeuvrability with the MTU engines. Miss Ellie, though, already has bow and stern thrusters and with its hydraulic steering, feels quite nimble. Among upgrades on this hull are larger generators for running the tropical-standard air conditioning, the hardtop and the stern thruster. Although MTUs are more common, Sunseeker also offers the option of twin Caterpillar C32 Acert engines for the US market, a popular option in North America in part due to Caterpillar’s financing program. Miss Ellie offers plenty of dry shelter inside, naturally, but also outside. 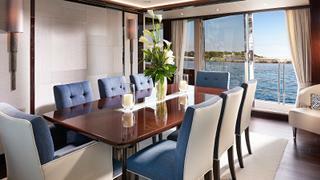 The overhang from the large sundeck provides good coverage on the aft deck fitted with a table and banquette, and a small group forms there, watching the rain fall on Biscayne. From inside, the weather also is a good show thanks to the big windows that flank the saloon and dining space. The tall bulwarks offer safe passage all around, and shelter from spray but also include a foldout section to form a small balcony off the dining area. In spite of her husky dimensions, owing to that extra volume, Miss Ellie shows herself to be gifted with speed and agility — a Sunseeker through and through. With a full load of passengers, we manage to reach top speeds in the high-20s, briefly flirting with 26 knots before the captain pulls back the throttles to initiate a vast arch with the GPS still registering 21 to 22 knots. At top speed, total fuel consumption is around 404 litres per hour. It is possible to halve that consumption by pulling back to 1,800 rpm for a good speed of 18 knots. Sunseeker is one of few production builders with the flexibility to personalise each hull to client’s desires or market requirements without slowing down the line. 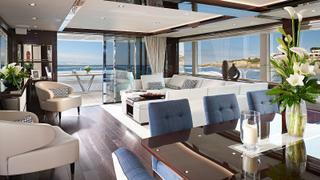 The platform of the 95 Yacht enables the shipyard to be quite creative. The yard is investigating several additional layout options, such as a six-cabin layout, and is also looking into ways to use the large space forward to create a country style galley. The Sunseeker 95 Yacht is quite the little big yacht and with its deep hull, this design offers a world of cruising possibilities.